[S367] United States Federal Census, Washington, District of Columbia, Population Schedule: Choctaw, Mississippi;, Enumeration District: 37; Supervisor District: 1; Page: 44, Dwelling: 396, Family Number: 396, Date: 1880. Louisa Earnest Morrison was born on 25 November 1822 in Alabama. She married Terry H. Bagwell, son of Fredrick Bagwell and Margaret Ann (Peggy) Crawford, in 1840. As of 1840,her married name was Bagwell. Louisa Earnest Morrison died on 5 January 1889 at age 66. 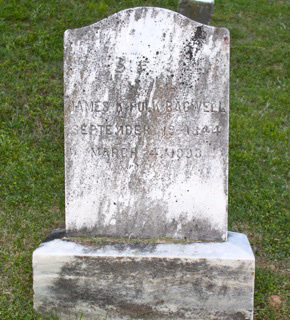 She was buried at Henderson City Cemetery, Henderson, Chester County, Tennessee. William H. "Tip" Bagwell was born on 20 October 1842 in Mississippi.1 He was the son of Terry H. Bagwell and Louisa Earnest Morrison. William H. "Tip" Bagwell was William H. "Tip" was a teacher.1 He died on 28 October 1912 in Diehlstadt, Scott County, Missouri, at age 70 of Gastritis caused by Malaria. Margaret Jane Bagwell was born in 1847 in Mississippi. She was the daughter of Terry H. Bagwell and Louisa Earnest Morrison. Sarah A. Bagwell was born in February 1850 in Mississippi. She was the daughter of Terry H. Bagwell and Louisa Earnest Morrison. [S886] United States Federal Census, Washington, District of Columbia, Population Schedule: Tywappity, Scott, Missouri; Enumeration District: 111; Supervisor District: 12; Sheet: 8B, Dwelling: 157, Family Number: 160, Date: 1900. [S885] Mary C Way Bagwell Grave Stone, Find a Grave, www.findagrave.com. Christinna Bagwell was born in 1858. She was the daughter of Terry H. Bagwell and Louisa Earnest Morrison. Giles A. Bryan was born on 27 November 1851 in Coffee County, Alabama. He was the son of Bethel Laneston Bryan and Elizabeth Russell. Giles A. Bryan married Sarah Elizabeth Bodiford. Giles A. Bryan died on 14 November 1928 in Coffee County, Alabama, at age 76. Julius Bryan was born in 1852. He was the son of Bethel Laneston Bryan and Elizabeth Russell. William E. Bryan was born in February 1853 in Coffee County, Alabama. He was the son of Bethel Laneston Bryan and Elizabeth Russell. William E. Bryan died in 1910 in Montague, Texas. Andrew Jackson Bryan was born on 6 June 1856 in Coffee County, Alabama. He was the son of Bethel Laneston Bryan and Elizabeth Russell. Andrew Jackson Bryan died on 3 June 1929 in Opp, Covington County, Alabama, at age 72. Francis Marion Bryan was born on 25 September 1857 in Coffee County, Alabama. He was the son of Bethel Laneston Bryan and Elizabeth Russell. Francis Marion Bryan died on 21 October 1923 in Atmore, Escambia County, Alabama, at age 66. Darling Dawsey Bryan was born on 29 May 1860 in Coffee County, Alabama. He was the son of Bethel Laneston Bryan and Elizabeth Russell. Darling Dawsey Bryan died on 17 June 1929 in Montgomery, Montgomery County, Alabama, at age 69. Her married name was Bryan. Sarah Elizabeth Bodiford was born on 18 January 1861 in Coffee County, Alabama. She married Giles A. Bryan, son of Bethel Laneston Bryan and Elizabeth Russell. Sarah Elizabeth Bodiford died on 27 February 1925 at age 64. Steve John Futo married Wendy Lea Bagwell, daughter of Wendell "Wendy" Lee Bagwell and Melba Louise Hogue, before 1984. [S364] Email from Tracy Weeks and Melba Bagwell dated September 2 - 5, 2008 to Hunter Wayne Bagwell - Subject Line: Wendell Bagwell Family History. Jan (?) married Ronald Harold "Ronnie" Buckner. Amanda J. Bagwell was born on 5 May 1867 in Mississippi.1 She was the daughter of William Asberry "Billy" Bagwell and Sarah Elizabeth Box.1 As of 25 December 1887,her married name was Lee. Amanda J. Bagwell married George James Lee on 25 December 1887 at Choctaw County, Mississippi. Amanda J. Bagwell died on 2 May 1929 in Mississippi at age 61. John Barnes Bagwell was born on 11 March 1870 in Choctaw County, Mississippi.1 He was the son of William Asberry "Billy" Bagwell and Sarah Elizabeth Box.1 John Barnes Bagwell married Meda Brannon on 21 January 1892. John Barnes Bagwell died on 24 September 1895 in Choctaw County, Mississippi, at age 25. Cherry Belle Bagwell was born in October 1878 in Choctaw County, Mississippi.1 She was the daughter of William Asberry "Billy" Bagwell and Sarah Elizabeth Box.1 As of 20 December 1898,her married name was White. Cherry Belle Bagwell married John C. White on 20 December 1898. Cherry Belle Bagwell died in 1914 in Choctaw County, Mississippi. She was buried at Choctaw County, Mississippi.